Which states have the lowest electricity bills? Electricity bills can vary greatly by month, depending on the weather – extreme heat or cold matters – location, local rates and overall usage. Prices usually are expressed in cents per kilowatt hour (kWh), but that doesn’t resonate with consumers: Americans don’t use one kilowatt hour. They use a bunch of them (an average of 867, according to the U.S. Energy Information Administration). So what are the states with the lowest electricity bills ? New Mexico took the coveted spot as the state with the lowest electric bills, at only $74.05 per month. The rate price was close to the national average at 12.04 cents per kWh, but the 10th lowest consumption rate of 615 kWh per month earned the state the top prize for savings on energy. At almost exactly $100 less per month than Hawaii, Utah residents got a good deal on electricity prices. The 10th lowest rate in the country combined with a fairly low consumption rate at 745 kWh per month kept Utah bills in a comfortable range. Thanks to the low rate, residents got an extra 130 kWh per month over their New Mexico neighbors for nearly the same price. The state known for skiing can also be known for low monthly electricity costs, rounding out the top three for lowest prices. With the 11.90 cents per kWh hitting below the national average and low consumption, Colorado residents can enjoy the scenery instead of worrying about paying the electricity bill. A small jump in price brings the list to number four, Illinois, at $85.12 per month. The deregulated energy state enjoys healthy competition between its electricity suppliers, which lead to a reasonable average of 12.3 cents per kWh, just a step below the national average. Residents also kept consumption under the 700-kWh bar and profit from lower bills. Maine came in with the 10th highest electric rate – the highest among the 10 lowest-paying states. Despite this, consumption of 546 kWh per month kept monthly bills reasonable. Iowa pushed the monthly pricing into the $90s. The state ranked 20th for both rate and consumption, which also managed to put it in the middle of the top 10 for lowest bill. At a consumption level just below the national monthly average of 867 but a $15 difference in monthly bill, Wyoming residents made out well. With a low electric rate, Yellowstone’s homeland made it through the year with bills averaging less than $100 per month. Arkansas tied with Louisiana for the lowest average rate at only 9.01 cents per kWh. That also means residents were able to use an average of 1,028 kWh per month, one of the country’s higher consumptions, and still see an electricity bill of only $92.62 per month. Thirteen was indeed lucky for Wisconsin, which landed at the 13th highest for the rate and also the 13th lowest for consumption. All that was left was number 13 for average monthly bill but the trifecta was not to be – the state ranked ninth, meaning residents got a better price anyway. Oklahoma rounds out the top 10 lowest paying states at $93.72 per month. The third lowest rate in the country (just one-hundredth of a cent behind leaders Louisiana and Arkansas) kept it on the list even with the highest monthly consumption of the 10 states with the lowest bills. Oklahomans got good bang for their buck with 1039 kWh for only $93.72. Hawaii ranked first for the highest electric bill, coming in at an average of $174.22 per month. It’s also the state where residents used the least amount of electricity at only 506 kilowatt hours (kWh) per month. But the islands also had the highest electric rate at 34.43 cents per kWh, contributing to their place at the top for expensive bills. 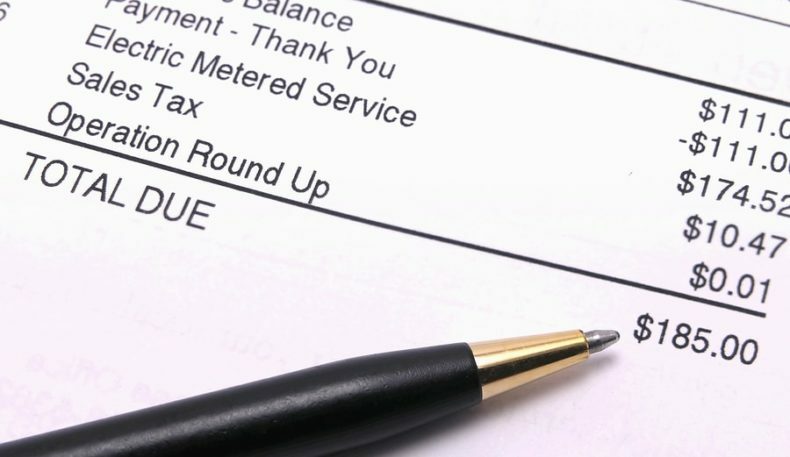 The second highest average bill went to Connecticut at $143.80 per month. While not the highest or lowest on any of the three ranking scales, the state’s comparatively low consumption at 690 kWh per month is no match for the 5th highest electric rate in the country, adding up to overall high monthly electricity spending. Alaska came in at an average of $132.16 per month, with the 3rd highest rate at 21.99 cents per kWh helping it into the third spot for bills as well. Low consumption helped residents stay out of the top billing spot, and only a 16 cents difference separated it from dropping to number four. With the third highest consumption rate in the country, Alabama was expensive, with an average electricity bill of $132.00 per month. The electric rate was lower than the national average and 23rd lowest (or 28th highest) overall, but the 1136 kWh per month consumption boosted the state up the list. Though residents didn’t use much energy in the country’s smallest state, the second highest rate per kWh pushed Rhode Island up the list with a $129.88 average monthly bill. At a rate nearly double the national average of 12.47 cents/kWh, electricity cost here added up fast. The Sunshine State sat in the middle of the pack for electric rate, but bills went up because of high energy usage – think air conditioning. The average resident used 1089 kilowatt hours per month, the 6th highest consumption in the country, which added up to an average monthly bill of $129.16 per month. Back in New England, Massachusetts ranked below its southern neighbors but above a lot of other states at a bill of $128.20 per month. Residents were 7th lowest for consumption, using on average only 583 kWh per month, but one of the highest rates of 21.99 cents was sure to keep overall prices high. Near the bottom of the East Coast and the bottom of the list for most expensive bills was South Carolina at $127.35 per month. Its average rate was exactly that, average, but a high consumption of 1082 kWh per month kept the Palmetto State in the high cost playing field. Arizona stacked up in the middle for both electricity rate and consumption, but those two factors combined landed it in the top ten for pricey bills at $126.65 per month. Luckily, as far as the top ten go, only Mississippi scored a lower monthly cost meaning Arizona wasn’t the worst of the worst where electricity cost is concerned. With high consumption but a low rate, Mississippi averaged out into the last spot on the top ten of most expensive states. With a monthly bill of $125.88 Mississippi was nearly $50 behind Hawaii in the number one slot, meaning Mississippians saved nearly $600 compared with their Western compatriots. It’s a high consumption of 1,132 kWh per month that kept them on the list, but just barely.